For the past two months, food costs have been increasing and the grocery store sticker prices are starting to rise. Beef, pork, and poultry (the most commonly consumed meats) as well as eggs and dairy all have increasing prices. And, we’re still waiting to see just how much the California drought will affect fruit and vegetable prices this season, but predictions are that prices will increase. Let's see. If all food prices rise simultaneously (and rise relatively faster than all other goods), the quantity demanded of food should fall (albeit not very much because the demand for 'food' is relatively inelastic). This seems like a good time to mention obesity. If the price of only some foods are rising, relative to other types of food, then the quantity demanded of the higher priced foods will fall, but the demand for substitute foods will increase; causing higher prices for the substitutes and higher quantities demanded for the substitutes. So the question becomes, what are the substitutes for beef, pork and poultry? "Governments Await Obama’s Move on Carbon to Gauge U.S. Climate Efforts"
President Obama is expected to announce on Monday an Environmental Protection Agency regulation to cut carbon pollution from the nation’s fleet of 600 coal-fired power plants, in a speech that government analysts in Beijing, Brussels and beyond will scrutinize to determine how serious the president is about fighting global warming. The regulation will be Mr. Obama’s most forceful effort to reverse 20 years of relative inaction on climate change by the United States, which has stood as the greatest obstacle to international efforts to slow the rise of heat-trapping gases from burning coal and oil that scientists say cause warming. Also paying close attention will be Saudi Arabia, which has sought to block global action on climate change. Economies that are deeply dependent on producing fossil fuels fear that lowering the global demand for oil and gas presents a grave economic threat. The Indiana University School of Public and Environmental Affairs (SPEA) seeks to appoint two visiting assistant professors on the Indianapolis campus as part of its new Political Economy and Environmental Research (PEER) Initiative. These visiting professors form the centerpiece of the PEER Initiative and will serve primarily research-oriented appointments, producing scholarship on policies related to markets, entrepreneurship, voluntarism, or regulation. The PEER Initiative supports the development of young public affairs scholars, including economics and political science. PEER visiting assistant professors will enjoy a greatly reduced teaching load, teaching three courses over two semesters. Successful candidates must be able to teach core courses in a public affairs undergraduate or graduate curriculum (e.g., statistics, methods, public finance). Appointments are expected to be for one year, renewable for another based on successful research and teaching performance. The ideal candidate has recently earned his/her Ph.D. (in public policy, economics, political science, or related fields) and seeks another year or two to develop his/her research program in pursuit of a tenure-track position. Research interests in environmental or urban policy arenas — intersecting with themes of markets, entrepreneurship, voluntarism, or regulation — are preferred, but other topics will be considered. Visiting assistant professors in this program will be expected to publish in peer-reviewed journals, contribute to a research program on urban environments and political economy, and gain experience as an instructor. They will do this in a strong and committed academic environment. “Live Crabs, $5.99 per pound” reads the paper sign hanging on the glass door of Saltwater Seafood, which on a good day sells 2,000 pounds of fish and shellfish. Two years ago, that same North Carolina hard-shell blue crab cost customers just $2.99 per pound. It’s a sign of a faltering North Carolina commercial fishing industry. A surge in prices has accompanied a drop in the state’s fish and shellfish harvest, which fell in 2013 for the fourth year in a row to the lowest in 10 years, according to a recent report from the N.C. Division of Marine Fisheries. Rising costs, shoaling and regulations all increase the costs of production and decrease supply. Also, seafood demand is inelastic when quantity falls and spending rises. The number of people hitting the road for Memorial Day this year continues to edge up, as gas prices remain stable for the third year in a row. Why don’t travelers have to worry about pain at the pump this year? The national average retail price for gas leading up to the holiday was $3.67, little changed from last year at this time and lower than the prior two years. Gas prices can be volatile, but the past few years have been in a relatively steady range. There are a multitude of reasons that gas prices haven’t gone haywire. For one, economic growth has been steady but unspectacular. A deep recession such as the one that began in 2007 will send prices plunging and strong growth means greater demand and higher prices. The best predictor of gas prices is the cost of oil, and though there have been global hotspots over the past few years, there haven’t been many major supply disruptions. Crude isn’t the only factor in gas prices, of course. Another important input is the refining process. This month more oil moved smoothly through the process in the U.S. than last year, keeping prices lower even as crude prices tick up. But there’s another long-term trend helping to keep a lid on prices in the U.S. Demand and consumption by cars has been flat or falling. More fuel efficient cars are lowering the amount of energy consumed, according to the U.S. Energy Information Administration. And at the same time, Americans are driving less for a range of reasons, including an older population and lower economic growth and employment. We drove all the way to Price Lake for some car camping. A travel cost model would predict that we'd visit there a lot more often than we do. Marine Resource Economics June 2014, Vol. 29, No. 2: 85-87. Marine Resource Economics June 2014, Vol. 29, No. 2: 89-109. Marine Resource Economics June 2014, Vol. 29, No. 2: 111-131. 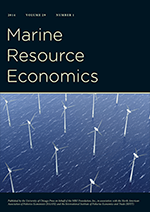 Marine Resource Economics June 2014, Vol. 29, No. 2: 133-156. Marine Resource Economics June 2014, Vol. 29, No. 2: 157-176. Marine Resource Economics June 2014, Vol. 29, No. 2: 177-198. Gremlins intervened in the preparation of my paper “The Economic Effects of Climate Change” . . . minus signs were dropped from the two impact estimates . . . [also there were] two overlooked estimates . . .
I’m not sure what is up with the gremlin, but in my own work I’ve introduced major errors into the analyses on occasion. Sometimes it happens when I’m copying numbers from a printed source into a typed document, or even when editing a document. So I could definitely see how minus signs could disappear. I’m reminded of the recent case of Reinhart and Rogoff who introduced major errors in data processing and analysis into an influential paper on macroeconomic policy. The errors were undiscovered for years. Please read the rest of the post and Tol's comment. There is some great (and simple) stuff on interpreting meta-analytic data. I live in great fear that I've made a simple data mistake that ends up being published. In our 2000 REE paper, the version that I presented at Colorado State University (thanks to John Loomis for scheduling me when I was thereabouts) was wrong ... although, the errors went in the direction of supporting my view that combining revealed and stated preference data could be beneficial ... which we corrected before submission. *Here is the first post on this topic. Political bias at the Environmental Economics blog? I noticed some followers actually seem to have to apologize to you for even considering a GOP view. Am I the only one who challenges your opinions? Do your politics follow you into the classroom? I hope you realize that if less than 2% of those that voted for Obama would have voted for Mitt, Mitt would have won the popular vote. Point being this country remains pretty evenly split. I hope you present a fair and balanced classroom. This criticism stings since I try my best to be objective and politicians on both the right and left tend to ignored the efficiencies of incentive-based environmental policy (albeit, for different reasons). That said, politicians on the right tend to be more critical of nonmarket valuation. However, I do vote a certain way and some of that might creep into my posts. Considering the political bias of the entire blog, I'm a little left and Tim is a little right (we even did a test to confirm it). But, amazingly we seem to come to the same conclusions about environmental and natural resource policy. I would claim that we have a neoclassical economic bias at this blog instead of a political bias. I would also admit that, having worked in the UNC system for 25 years and with two kids in public schools, I have a pro-education bias. When the NC state government cuts funding to schools I tend to find that to be a bad decision because it hurts my income and hurts my kids. But I don't think that criticism of policitians who ignore the consensus of climate science and social science (public finance) is necessarily political. Is it? Please point me to an example of someone apologizing for even considering the GOP view and I'll be more inclined to look inward. Are you the only one? No, we used to have a lot more criticism. Do my politics follow me into the classroom? I don't think so. I once asked my my students if they thought that I was Republican or Democrat. There was no consensus. I think this is because belief in economic theory tends to make one more politically conservative (for lack of a better term). For example, I know a number of political liberals (for lack of a better term) who prefer the earned income tax credit to the minimum wage as a policy to help low earners. Al Gore won the popular vote. If he had become President we would have likely signed the Kyoto Protocol and adopted a bunch of command and control environmental policies. Hoo boy! Imagine how we would have been criticized by anonymous trolls for being partisan hacks. Thank you for your concern for my students. I never said I was on the Dream Team! Stating that they just want to make sure it’s something everyone keeps in mind going forward, an international consortium of scientists gently reminded the world Wednesday that clean energy technologies are pretty much ready to go anytime. “We’ve got solar, wind, geothermal—we’re all set to move forward with this stuff whenever everyone else is,” said Dr. Sandra Eakins, adding that researchers are also doing a lot of pretty amazing things with biomass these days. “Again, we’re good to go on this end, so just let us know. You seriously should see these new hydrogen fuel cells we have. Anyway, just say the word, and we’ll start rolling it out.” At press time, representatives from the world’s leading economies had signaled that they would continue to heavily rely on fossil fuels until they had something more than an overwhelming scientific consensus to go on. For all you Ron Harpers out there, The Onion is satire (and yes, the secondary joke of this post is what is known as "piling on"). An Appstate alum got a job! I graduated from Appalachian in 2001 and now work for Conservation Strategy Fund, an organization in California that focuses on global conservation work through the use of economics. I’m reaching out to you because we’re in the process of creating an exciting new resource and hope you or your students could benefit from it. We’re developing a series of animated videos that tackle such topics as market failure, valuation methods, fisheries econ, forestry econ and cost-benefit analysis for starters. Our first two videos, on public goods and a CBA overview, are up and we’re adding more almost weekly. We think they could easily serve as complements to lectures or as refreshers on concepts learned previously. Take a look if you get a chance and we welcome any feedback you may have. And I hope you are enjoying the current season in Boone, I remember it as being one of the best times of the year. I've subscribed to the YouTube channel and watched the "CBA" overview video (more are promised on details of "BCA"). It is very good and I'll show it to my class this fall. Why would you call it cost-benefit analysis when net benefits = benefits - costs? Therefore, I strongly prefer benefit-cost analysis.